Kwik Kar Marsh has never offered or will offer Nitrogen Tire Service because it adds little to no value to your tires. Many automotive dealerships, lube centers and auto repair shops offer Nitrogen Tire Service for roughly $39.99. So what should you do if your dealership says you need it or charges you for it? Just say no thanks and get your money back. Hyundai Motor Company along with its subsidiary, Kia, recently released the following Technical Service Bulletin. “This service appears to add little, if any, appreciable value to Hyundai and Kia customers. Tires should be filled with dry compressed air using the specifications listed on the driver’s door jamb plate or in the Hyundai or Kia Owners Manual. Dry compressed air already contains approximately 80% nitrogen. Keeping tires properly inflated with dry compressed air is sufficient to keep the tires in good condition throughout their useful wear life. 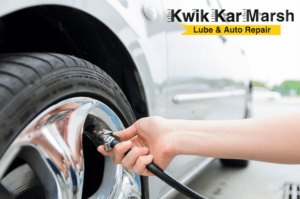 At Kwik Kar Marsh, we use dry compressed air to properly inflate your vehicle’s tires to the recommended psi. We never charge for inflating tires, so even if you are not our customer yet, come by if you ever need your tires filled. Kwik Kar Marsh is your Neighborhood Dealership Alternative and was named the nation’s “Best Looking Lube Center” in 2016 by National Oil and Lube News. 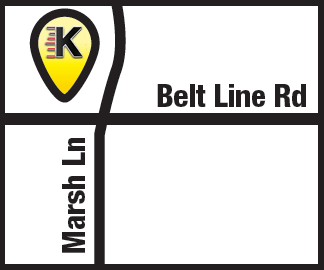 Kwik Kar Marsh is located at 1049 Marsh Lane at Belt Line Rd.